Green River, Utah – June 1, 2012 – Holiday Expeditions announces a Private Charter Trip Special where adventure seekers can save up to 40% off the cost. The Green River trip through Lodore Canyon is the ideal whitewater rafting trip to take during a low water year because the Green River is fed from a full Flaming Gorge Reservoir. Since the Green River is dam controlled, great white water flows all summer long and you won’t notice any difference in thrills and excitement from any other year. A Private Charter Trip through the majestic beauty of Dinosaur National Monument offers you a rare opportunity to experience the landscape as never before. Encounter 800 foot canyon walls superbly crafted by Mother Nature of Precambrian Bedrock along with exquisite vermillion rock formations. This would be an excellent retreat for Companies, Clubs, Reunions, Large Families or groups of friends. Adventure Seekers will enjoy big sandy beaches great for camping and relaxing around a big campfire. All food and beverages are supplied. This trip is so well rounded that it offers a little of everything and a little bit of heaven. You will experience exciting intermediate level whitewater with superb side canyon exploring and gorgeous scenery. Adventurers will take delight in wildlife viewing, beautiful camping areas, and opportunities for individual kayaking and exploring. It truly has something for everyone! 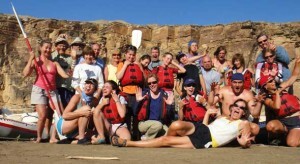 Make some lasting memories this year with the family friendly white water rafting trip through Lodore Canyon. Take advantage of the savings on the Private Charter Trip Special available for a limited time from Holiday River Expeditions. For over 46 years, Holiday River Expeditions has offered white water rafting trips, and hiking and biking trips on the Colorado and Green Rivers. These thrilling trips offer breathtaking scenery on the ride of your life through the Grand Canyon, Lodore Canyon, Westwater Canyon, and Cataract Canyon. They also offer Family Rafting Trips.